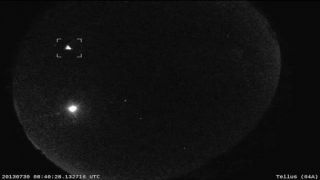 This still image from a NASA video shows a brilliant fireball caused by an early Perseid meteor on July 30, 2013 as seen by NASA's all-sky camera network. The Perseid meteor shower is still days away from hitting its peak, but a NASA camera network has already captured video of fireballs from the annual night sky light show. NASA's network of meteor-tracking cameras spotted the early meteor last week in a preview of what may come when the Perseid meteor shower peaks over the upcoming weekend. The 2013 Perseid meteor shower will peak overnight between Aug. 11 and 12, and Aug. 12 and 13, Cooke wrote, adding that NASA's fireball network is already catching more Perseids as the time of peak activity nears. The Perseid meteor shower occurs each year in mid-August when the Earth passes through a stream of dusty debris from the Comet Swift-Tuttle, which takes about 130 years to orbit the sun. The comet last passed through the inner solar system in December 1992. Cooke has said that the Perseids may be such a dependable and prolific meteor shower because of the size of their source. Comet Swift-Tuttle has a huge nucleus just over 16 miles (26 kilometers) across, whereas the cores of most comets are only a few miles wide, he said. The meteor shower is also known for spawning fireballs — which are extremely bright meteors — every few hours or so when observed under dark conditions. The Perseids get their name because they appear to radiate out of the constellation Perseus. However, staring straight at the constellation during the peak period is not the best way to observe the meteor shower, Cooke has said in the past. The best way is to be patient and stare straight up, and make sure you find a nice dark observing spot. "If you'd like to try to watch this year's Perseids, get away from city lights. Look for state or city parks or other safe, dark sites," advised the editors of StarDate Magazine, a stargazing publication of the McDonald Observatory at the University of Texas at Austin. "Lie on a blanket or reclining chair to get a full-sky view. If you can see all of the stars in the Little Dipper, you have good dark-adapted vision." Most importantly: Be patient and get comfortable. With clear, dark skies, stargazers could see up to 100 meteors an hour, NASA's Jane Houston Jones said in one of NASA's video previews of the 2013 Perseid meteor shower. The best time to seek Perseid meteors will be in the wee hours of the morning, just after midnight, between Sunday, Aug. 11, and Tuesday, Aug. 13. Cooke advises observers to target their Perseids-hunting time for between Monday night at 10:30 p.m. local time and early Tuesday at 4:30 a.m. local time in order to maximize the chance of seeing meteors.